Kevin Harvick started second and finished first, collecting 10 bonus points and a playoff point. The No. 4 Jimmy John’s Ford quickly jumped to the lead on just the second lap of the race. He maintained the top spot until making a trip to pit road for a scheduled stop on lap 38 for four tires and fuel. Harvick raced back to the lead on lap 50 and maintained the top spot through to the conclusion of Stage 1. At the end of Stage 1, Harvick made a stop, where the team changed four tires and added fuel. Started first and finished first, collecting 10 bonus points and another playoff point. The 2014 Cup Series champion picked up where he left off at the end of Stage 1 by jumping out to a large lead. The “Freaky Fast” driver maintained the top spot until making a green-flag pit stop on lap 121 to get four tires and fuel. As green-flag stops cycled through, Harvick was back out front on lap 125, cruising to the win in Stage 2. The Jimmy John’s driver stopped during the caution for four tires and fuel. He returned to the track in fourth to start the final stage. Started fourth and finished first, collecting five playoff points. Harvick restarted the race in fourth place and quickly noted that the car handled on the tight side while in traffic. To address the issue, the team used a scheduled pit stop on lap 178 to make wedge and air pressure adjustments, change four tires and add fuel. With the adjustments Harvick was able to make his way to second place before a caution came out on lap 183. Noting the importance of track position, the team elected to stay out during the caution. Green-flag racing resumed on lap 195, and Harvick quickly jumped to the top spot. Harvick made one last trip to pit road for a scheduled stop on lap 225, where the team simply changed four tires and added fuel. Within a couple of laps Harvick was back out front and remained there to pick up his second consecutive Cup Series win of 2018. Harvick’s win in the Las Vegas 400 was the 100th of his career in NASCAR’s top-three series. He has 39 Cup Series wins, 47 Xfinity wins and 14 Truck Series wins. He is only the fourth driver in NASCAR history to accomplish the feat, joining Richard Petty (200 wins), Kyle Busch (184) and David Pearson (106 wins). 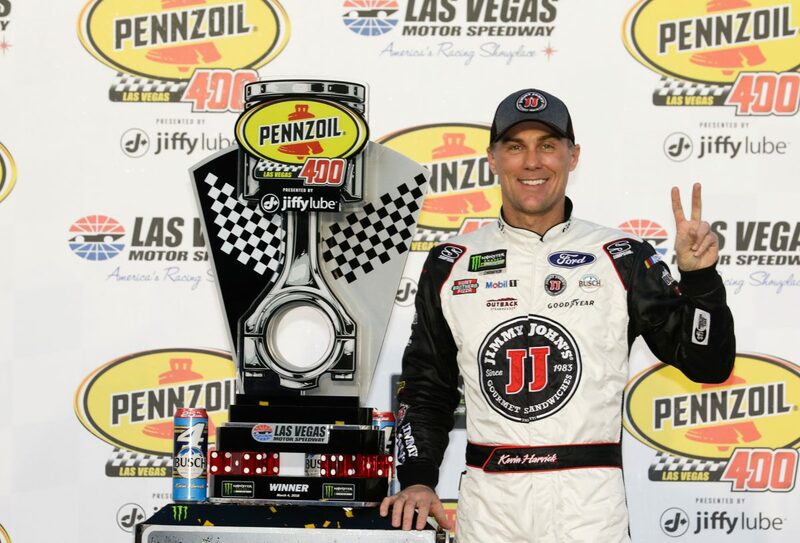 This was Harvick’s second NASCAR Cup Series win of 2018, his second at Las Vegas and the 39th of his career. It was his 16th NASCAR Cup Series victory since joining SHR in 2014. Harvick’s victory in the Las Vegas 400 marked the 45th overall win for Stewart-Haas Racing (SHR). It was the organization’s 41st points-paying Monster Energy NASCAR Cup Series win and its third at Las Vegas. Tony Stewart won at Las Vegas on March 11, 2012, and Harvick won on March 8, 2015. This was SHR’s fifth NASCAR Cup Series victory with Ford. The team won its first race with Ford when Kurt Busch captured the 2017 Daytona 500. Harvick’s margin of victory over second-place Kyle Busch was 2.906 seconds. This was Harvick’s second win/fifth top-five/seventh top-10 finish in 18 career NASCAR Cup Series starts at Las Vegas. He finished first in Stage 1 to earn 10 bonus points and one playoff point. He finished first in Stage 2 to earn an additional 10 bonus points and another playoff point. Harvick led five times for a total of 214 laps to bring his laps-led total at Las Vegas to 438.